Thames & Chiltern champions include Thames Water's Bin It Don't Block It drive. 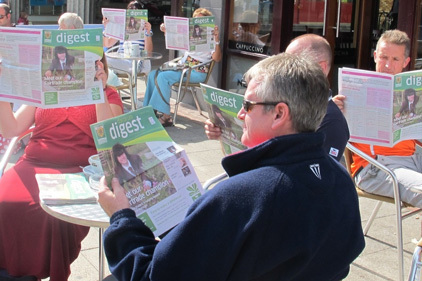 Dacorum Digest is the council's newspaper for residents and includes articles that highlight local issues and promote council services and a dedicated youth section. The newspaper helps boost the council's reputation by explaining services and how to access them, and has a balance of shorter news items and longer human interest features. Articles include links to further information on the website. The newspaper has recently been redesigned from A4 to tabloid size. In total 84 per cent of residents surveyed rated the newspaper as good or very good. Loud was asked to help Bahlsen raise awareness of Messino jaffa cakes. The campaign focused on the oblong shape of the Messino along with its taste. A teaser Twitter account using the oblong theme was launched, and live activity was carried out at the Oval and Reading Festival. A campaign website revealed that the activity related to jaffa cakes, and Messino boxes branded as 'Oblong Jaffa Cakes' were sent to media. Activity was also carried out at shopping centres, with handouts of Messino samples and discount vouchers. The campaign generated 250 media hits and sales increased by 94 per cent. The Thames Water press office ran a campaign to highlight the consequences of blocking drains, a problem that costs the company more than £12m. It was launched with a survey that found 41 per cent of customers flushed unsuitable products down toilets. The PR team coined the term 'sewer abuse', which was widely picked up by the media. The campaign included a photocall, an appearance on ITV show Grimefighters, and a Christmas-themed segment making heroes of people who work in sewers. The media were invited to see the sewers beneath Leicester Square. The campaign achieved 101 pieces of coverage in target media, and there were 9,000 hits to the campaign site. The press team at Thames Water has carried out campaigns including the award-winning Bin It - Don't Block It and a price review communicating the need to raise bills to fund upgrades. The team also runs a campaign with the Mayor of London to promote tap water at London's restaurants, cafes and bars. The team of three has a budget of zero.